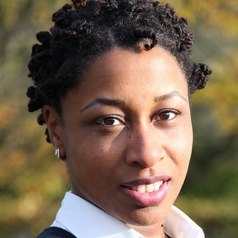 Nicola is a Lecturer within the School of Education and Deputy Director of the Centre for Research in Race & Education. She is interested in practices that enable and challenge the continued manifestation of race inequity in contemporary societies. Understanding the role of privilege and power which are often overlooked in race debates is a key aspect of her work. She is especially interested in the ways in which racially minoritised groups survive, strategise and work to create legitimate, meaningful modes of existence, belonging and notions of self within mainly white spaces. Her work therefore engages with the concept of education in its very broadest sense to include both formal and informal sites of learning and social reproduction. Nicola previously led the Education Programme at the Runnymede Trust where she produced the teaching resource ‘Complementing Teachers: A practical guide to promoting race equality in schools’. She also designed and delivered the teacher training programme ‘Achieving race equality in schools’ to newly qualified and established teachers across England and was commissioned by the Ministry of Defence to train British teachers working at their bases in Germany and Cyprus. Her report reviewing the government’s progress in implementing the recommendations from the Stephen Lawrence Inquiry was debated in Parliament and, more recently she was called to give evidence to the Liberal Democrats Race Equality Taskforce. Nicola has written for both academic and lay audiences and her work has appeared across several print media including The Observer, The Guardian, The Evening Standard and The Voice newspaper. Her book (co-authored with David Gillborn, Carol Vincent & Stephen Ball) The Colour of Class: the educational strategies of the Black middle classes will be published by Routledge in November 2014.